**My Desert Cottage**: Are you ready to be inspired... again?? 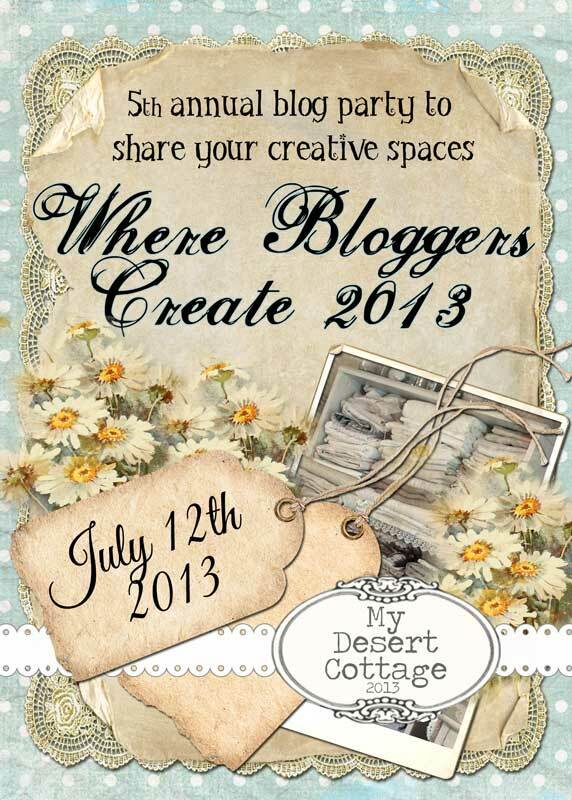 Where Bloggers Create 2013 is July 12th! Are you ready to be inspired... again?? Where Bloggers Create 2013 is July 12th! "To view my Where Bloggers Create post click here. To view the 2013 list of Participants scroll down... it's on the sidebar. :)"
Yes, it's that time of year again!! The inspiration will be overflowing as we all get together to enjoy Where Bloggers Create 2013! The date this year will be July 12th so you all have about 6 weeks to fluff up your spaces and get them camera ready... or leave them be and let us peak into what a real working studio looks like! Last year we saw such a wonderful variety of studios from ladies all over the world. We had scrapbookers and fiber artists, jewelry designers and painters, mixed media artists and paper crafters. We saw as many different kinds of artists and crafters as you can imagine and the amazing studio spaces that they create in. I look forward to this event every year. Friends are made, ideas are garnered, and we are all inspired!!! Every year I am blown away by your creativity, ingenuity and passion for what you do. I hope you all will join me again this year regardless of whether your studio has changed much since last year or not. Remember, it has been a year since we last visited your space so it will seem brand new once again!! If you have never participated, I encourage you to join in on the fun. We want to see where you create the lovely works of art that make your heart sing!! So, once again this is how it will work. If you want to participate leave me a comment on this post, or send me an email. If you have more than one blog, please specify which one you want me to link to. I will add your name to the list of participants on my sidebar. On the night before the party(July 11th), post your photos and stories about your studio, yourselves and your art. (This assures that the early risers or those bloggers in other parts of the world can see your post on time.) We all love lots of pictures so don’t be shy!!!! On the day of the party we will all meet here and you can spend the next few weeks blog hopping to visit everyone’s blogs and get a peak inside all the very wonderful and creative studios!! If don't already follow my blog, please consider doing so, so you don't miss out on any important party announcements. Oh! And please take the party invitation located on the upper right sidebar and place it on your blog to help spread the word. If you want to do a post about it... that would be wonderful!!! This party is a success because of all of you, and your willingness to help me spread the word about it. :) I would also love it if you would pin the image of the party poster located in this post. You all know how great Pinterest is and it would be wonderful to get lots of new studios this year. After all, the more participants, the more inspiration!!!!! Fantastic, I love participating every year. My blog is www.sun7designs.blogspot.com. Thanks Karen! I'd like to participate again - good reason to clean up my blog and room! darbycreations.blogspot.com Thanks! You KNOW I am In! You inspire me to organize, clean and create general cuteness....Can't wait!! Hugs and Love my friend! Hiya Karen..sign me up again friend.. This is so much fun every year! My blog is www.snipsandthreads.blogspot.com. Hi Karen, Please count me in. I'm looking forward to participating again. This will be so much fun. Yay! The announcement I have been waiting for since last year!!! Can't wait to participate again Karen, thank you so much for hosting this "Party-Of-The-Year" event. Oh and I pinned the badge; and THIS time I'm logged in to my proper Blogger account... geez. Just so there is no confusion for which blog to add to the list Karen. Thank you so much again! I would love to join! I've been working on my studio and would love to spruce it up for this event! Looking forward to your purr-ty Ms. Karen! Thanks for hosting it, despite your busy schedule! Oh, this is just the push I need every year to freshen up my studio. I'd love to participate. I'm in! Not a lot has changed so I was considering bowing out this year but July 12 is my birthday so I think that means I am supposed to participate, besides, some of my best blog friends were met through this party. Thanks for rocking it for another year! Well, my space is more a corner stuffed with a little of everything. Count me in for my very first Where Bloggers Create. I will feature your event on my blog in the next few days. On a side note: I LOVE, LOVE, LOVE, my new signature!!! Can't wait to do it again!! Moving in to a new studio this month-so excited to have a target date to be ready to photograph!! Thanks again for hosting! Hi, please count me in Karen! Hi Karen! So excited to join against this year....... My blog is stasalynn.blogspot.com. Can't wait to see all the beautiful spaces this year! Oh Karen I'm just getting so excited like every year when you announce the WBC party and of course I'm going to participate for the 5th time yay! It's exactly the kick I needed to clean up and rearrange my studio again. Looking forward to see all the beautiful creative spaces in blogland! Wishing you a happy month of June! I would love to participate again and I'll put the button on my sidebar. Thanks so much for hosting this every year. I can't wait to visit everyone again. Now off to clean and renew my studio. Count me in. I'm looking forward to participating again this year. Oh, would love to take part. Didn't take part last year. It will also be a good excuse for a serious tidy up. Well, this will put a quick spin on cleaning up my studio!!! I cannot wait! HI Karen! I'm so excited to join this year. Just moved into a new studio space and have been designing with this in mind! In fact, I've checked back and revisited many bloggers from last year, just to get ideas. Thanks so much for doing this!!! I'll be sure to put your announcement on my side bar. I had a feeling the time was snicking up on us. Please enclude me this year. A whole new house and studio. I would also like to talk to you about my blog face. Hi, I joined in a few years ago, but life intervened so I was unable to participate but I definitely would like to do so this year. My blog is called Amanda's Baskets. Thanks. You can count me in again. I have joined it every other year and look forward to seeing everyone's space. this year i thought i would use my other blog Olive Grove Primitives. I'll see if I can't come up with something..
Hi Karen, yes this is one of my favorite blogging events. It is also a really good reason to clean, paint, organize and basically clean the craft room for the bloggers bonanza you are hosting! Yay! Please add me to your list! And thank you once again! Of course I'd love to join you, this is our annual party and I wouldn't want to miss it. Thanks for hosting this fun event!!!! I would love to join the party... Thank you for the invitation..
hi Karen. Please add me to the list for the studio party. Looking forward to it. Just found this link and would like to join. I am in the process of doing more on my blog and trying to fit some crafting in (I was meant to be moving house, but it fell through) so everythings all a bit 'temporary' at the moment but I love seeing other peoples creations and would love to meet some new people too. I just LOVE these!!! Please count me in as well!!! Count me in again...so much fun and inspiration! So wonderful that you are doing this once again! I'm in! I am looking forward to this. Add my blog to the list please. And thank you for hosting this again this year!!! Hi Karen, Well I enjoyed being a cheerleader last year so much so I think I'll just jump in with both feet and join in the fun this year! I've been busy getting our house together after the move and think my craft space will be ready (& even if it's not) to share...count me in! You can sure add me, and I would love to join in again. I miss blogging and this is just what I need. I am excited to be part Where Bloggers Create. I think it will take me 6 weeks to get it ready to photograph. Wow party time rolled around fast! I look forward to it, so much inspiration gathered up in one place. Thanks for the time you spend on this Karen. This will be a great excuse to tidy the tornado that is my Studio! Please add me to Where Bloggers Create 2013. My name is Janet and I have a blog called Graceful Rose and I would love to participate in the "Where Bloggers Create Party" this year. This will be my first year. I have been working hard trying to get my studio ready. I can reached by E-mail at jsgreer@twc.com and my blog address is gracerose.blogspot.com. Thanks so much for hosting this party. I also have posted your logo on my side bar and I will pin. Thanks again. Hi there Karen, I would not miss another blog party for the world. I want to be included too and my blog address is askmichelesomethingspecial.blogspot.com Thanks so much for doing it again. SO thrilled to see this link-up in Inspire Me Monday this week - I've been checking your blog with anticipation for the upcoming dates! Hi there, yes, please add me! this will be my first year, I can't wait, this will be so much fun! Count me in! Thank you for all you do! I'm so exited! Hello. I'm a newbie. Happy to take a part for the first time. Got to reorganize and clean! Thanks for all your hard work every year! I will be there again this year!! i wouldn't miss it for the world! thanks karen! Please do count me in again- I loved meeting everyone last year! I hope to finally join the fun! I've been waiting and waiting for this! I am definitely doing it again this year. I always look forward to it---so much inspiration. Please add me. This is a fantastic idea, would love to participate. I have been in the process of organizing my new space since moving in a few months ago. This deadline will give me added incentive to get it done! I always do better with a deadline. Thanks for the opportunity. I'd love to take part again this year. There have been a few changes in my workroom since last year, plus it'll be an incentive to have a good tidy up! Thank you for hosting again this year. Had the best time with this party last year, and would LOVE to join in again. my blog is fromchaoscomeshappiness.com . MUCH ThankS!!!! Thanks for this wonderful and fun event! I would be so excited to join again this year! Please add my blog to the party. And thank you for hosting such a wonderful and fun party each year. I look forward to it! Wow...I can't wait for this! I just love taking a peek into others studios! I am your newest follower! I just can't miss the fun again this year. I am on a little hiatus from my blog and going in lots of directions, but will participate and be ready to return that day and then back to blogging in the fall. Count me in. Thank you so much for hosting again this year. Have a wonderful week and see you in July. I am happy to take part this year...last year was a non-event for me...other than actually being alive...vbg. Since then, I too have made changes to my work room. But I have been slack in up-dating my blog...hopefully this will give me the incentive to do so. Please add my blog again this year www.barecubdesigns.blogspot.com - Will get busy taking photos (and cleaning up) Thanks! I just love to take part again this year!!!!! Yes Karen: I would like to be included again this year in the Blog Tour. Please list me as www.mcreatesdaily.blogspot.com my e-mail address is mmsnare@gmail.com Thanks! Hugs and love to you sweets! Please count me in again, and thanks so much, Karen! I wouldn't miss it. Count me in. My blog is An Artist's Life at http://richnessofday.blogspot.com. Yes! Please add me to the list! I haven't done this in a few years and I have a new sewing room! Same old stuff--just a new room. Can't wait to see all the wonderful sewing rooms and fabulous ideas! Thank you! I would like to use my www.Isewforyou.blogspot.com blog please. Thanks so much! We know how much work and time this takes. It just might be the spur I need to get properly stuck in to my workroom makeover. My BFF one of 3 others Bevlea sent me the link to this. I will join in for the first time. Will give me the inclination I need to get back to craft room after being chair bound after a knee replacement. I will look forward to visiting all the yummy spaces. see you soon in my Studio! Karen I need this to get motivated !!! This will be my first year...Thanks for hosting such a fun party! I would love to join in. This will be my first party and I can't wait. I'm so excited to participate this year! Thank you for the opportunity! I can't believe I've never participated in this. I'd be so excited to join in this year! Sandy Leigh at EatWriteDreamStitch.blogspot.com. Hi Karin, would love to join in the fun! Looking forward to the party!! I would love to participate again, my blog is http://allisonmariereschke.wordpress.com/ and is called "Grace and Abundance". Thank you! I just put the button on my blog:):) I was a good girl:):) lol!!!! So EXCITING!!!! Can't hardly wait..
What a great idea! I can't wait to show my "crafting corner", so count me in! Would love to join in..This will be my first time so I hope it will be ok. Some of the ladies from last year have wonderful studios. I blog here and am looking forward to it. Please add me to the list to participate. I have looked forward to this event every year, and now I'm ready to take the plunge and post pics of my new studio! I'm still in the middle of moving in, but would love to share ideas with other crafters! Thanks for hosting such a fun hop! Yes! I would love to join the party again! You are wonderful host to do this again. I wouldn't miss it. It is one of 2 events that I would never miss in blogworld. Count me in! I would love to join in and I have your button on my blog. So excited as this is my first time! Hi Karen, please add my blog to the list. I had a blast last year and looking forward to another great blog hopping party! Yeah please count me in again. The whole party is such an inspiration to all who participate and thank you dear friend for hosting it for yet another year and everything you put into it. Oh my! We're new to the blogging world and I just discovered your blog. I am sooo excited!!! We do not have a studio and do not create art other than our beautiful perennials...but I am so happy to follow along as I LOVE the arts and artisans. Thank you for creating this space and I can't wait to see everybody's inspirational shares. Awesome!!! I've just come across your lovely blog via Annette (so many memories). I'm in the middle of renovating my studio space, but I'd love to participate anyway! I loved last year's party and want to play again this year! Hugs! I'd love to participate! Can't wait! This sounds like great fun and will be a first for me, so count me in. And mostly, thanks for all of your hard work in bringing this together! Joy Joy! Count me in! WOW what a wonderful idea!!! I would love to join this will be my first time. Karen, I have my post ready for WBC and here is the link. I am Janet from Graceful Rose. Thanks for hosting this great party! I would love to join, this will be my first time! I've just added your button on my Blog. I would love to share my new studio in this years party. Can't wait to see what everyone's sharing! I wouldn't miss it! Thanks for hosting this again. I am so looking forward to participating in WBC for the first time this year! Please add me to your list, merci! Is it too late to jump in? I don't know why, but I had myself convinced it was at the end of the month even though I posted about it on my blog. My brain doesn't work right sometimes. I have been told in no uncertain terms by my friends that I have to show my little French craftavan :-), so please add me to the list of participants. It will be on my lululizinlalaland.blogspot.com blog. I am so looking forward to visiting all those beautiful creative spaces. Yikes, I thought I had left a comment on here, but can't see it, so I had better do it again. Please add me to the list of participants. The post will be on this blog - lululizinlalaland.blogspot.com. Thank you so much for organising this fabulous event again. I would love to participate if it's not too late! I don't know if I'm too late, but I would love to participate again. Can you use my Whatever Lola Wants Lola Gets blog? Thank You! Can't wait to see everyone's spaces again! Thank you so much Karen for letting me slip in at such a late date. You are so sweet!! And just know all of your hard work --(I can't imagine the time it takes)-- is so appreciated! Blogland would not be the same without the WBC party. I found myself looking for a homemade clip it up and I found your beautiful blog and saw this invitation! This is such a wonderful Idea!!! I hope it is not too late to participate?! Thank you very very much for your answer and for your great idea!